How to find your part number? 3. Select our corresponding part number from the chart below. 4. Click on corresponding Buy Now button Below chart. If you DO NOT want ends attached, please add to customer comments at checkout. 1430 Number on Balance 10-12 lbs Sash Wt. Part Number 60-143. 1440 Number on Balance 12-13 lbs Sash Wt. 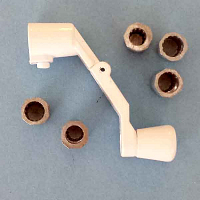 Part Number 60-144. 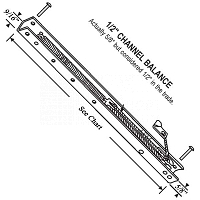 Sash weight 4-6 lbs 16 Inch Channel Balance. Part Number 60-151. 1520 Number on Balance 6-10 lbs Sash Wt. Part Number 60-152. 1530 Number on Balance 10-12 lbs Sash Wt. Part Number 60-153. 1540 Number on Balance 12-13 lbs Sash Wt. Part Number 60-154.